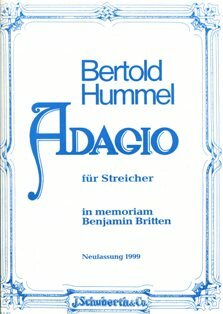 The Adagio for Strings in memoriam Benjamin Britten, op.62a, was composed immediately on receiving news of the death of the great English composer and was written down between 8:00 and 9:30 on the evening of the 4th December, 1976. It is a composition for three polyphonal parts and can be performed by soloists or ensemble. A gesture from Britten's "Simple Symphony" closes the brief, expressive piece. I met B. Britten at various music festivals. He was a personality and colleague of wonderfully fine feelings. In him I met a figure of importance not only for his operas of essential significance for our century and for his influential works of absolute music, but also for his work as a conductor, chamber musician and accompanist of song. Amongst his music, I found an Adagio for Strings in three parts on the death of Benjamin Britten. It takes its place in the tradition of the Funeral Music by Lutoslavsky for Bartok and a series of other pieces of great beauty. It is an Adagio with many long notes, with many plaintive seconds and held chords which are carried away in the wind, a work of memories and sadness. I found it very powerful. In the Adagio, op 62a, Hummels pays homage to Benjamin Britten, who himself had had learnt much from Henry Purcell, the Orpheus Britannicus of the Elizabethan period - thus Hummel takes the path of a great tradition which had always retained a number of special features in comparison with the continental tradition. A melody starting with a falling fifth and then rising immediately with a seventh, rich in its intervallic contours, undergoes almost playful melodic and rhythmic dissection, only to be reconstructed in ever-new sequences. Fascinating tone colours in the accompanying parts support with their bold, harmonically tense lines the development of the melody. It is always the falling and rising lines that meet each other with dynamics up to fff and finally fade away at the end in a muted ppp. An affecting work in one movement, making use, on a foundation of tonal, emphatically diatonic harmonic practice, of a thoroughly modern musical language.